Brave Wrexham couple Sian and Steve help raise funds for children’s charity | News by Wales Express News, People Before Profit! A couple who married after falling in love at the care home where they both live were guests of honour at a fun day that raised money for a children’s charity. Friends and family turned out in force to see Sian and Steve Ferrier tie the knot last year at the Ramada hotel in Wrexham. 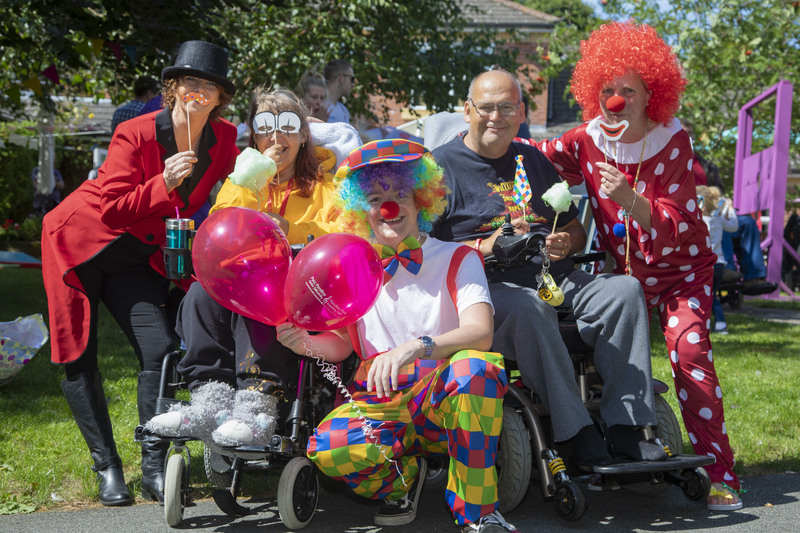 Pendine Park family and residents fun day ; Pictured (from Left) are Elaine Lee, Sian Ferrier, James Wallice, Steven Ferrier and Chris Lewis. Brave Sian, 47, who has cerebral palsy, epilepsy and other medical issues, left her motorised wheelchair behind to walk down the aisle for the magic moment. As they approach their first wedding anniversary, the couple now have their own apartment at Pendine Park’s Bryn Bella care home and were thrilled to be part of the care organisation’s action packed fun day. Among the attractions there were candyfloss and face-painting stalls, hamburgers and soft drinks, crazy golf, a strongman game, coconut shy and a set of stocks, and a raffle boasting a host of prizes. The residents and staff raised a total of £361 for the NSPCC which is Pendine Park’s chosen charity this year. The theme for the annual event was the circus, in honour of Pendine Park proprietor Mario Kreft MBE whose father was a bear and lion trainer. Organiser Jen Roberts said: “We thought it was particularly appropriate because it’s the 250th anniversary of the circus this year. Despite being christened in a circus tent Mario Kreft never wanted to follow in the footsteps of his late father, Franz. After starting out in catering, Mario and his wife Gill set up the Gwern Alyn care home where they could look after his grandparents and her grandfather. He was born in Durban and was the first ever baby to be christened in a Big Top in South Africa when the service was conducted in the circus ring by the Bishop of Durban. Because his father and his mother, Pamela, parents were travelling the world in the circus, he was brought up by his grandparents, Fred and Renee Warburton, in Trefnant near Denbigh. To follow the circus theme, Pendine Park’s enrichment and activities co-ordinator Elaine Lee took on the mantle of ringmaster, and activities co-ordinator Chris Lewis and weekend helper James Wallice, 18, of Wrexham, dressed up as clowns. Sian and Steve Ferrier entered into the spirit of the occasion and described the fun day as “brilliant”. “I’m just so pleased we are able to get married,” said Sian. “I thought when I had to move into a care home that was it. “My life as such was over and I had nothing to look forward to. I’ve always dreamed of getting married and to wed Steve is like having my dream come true. With the help of management and staff at Pendine Park, they now have a double bedroom and their own private lounge within Bryn Bella Care Home, which means they can be supported while living life to the full as a married couple. Staff visitors included Danielle Edwards, 26, and her five-month-old son Leo, her mum Julie and brother Kai, seven, and Amanda Richards and her daughter Macie Edwards, three. All from Brynteg, Danielle is a senior carer at Highfield care home, Julie is head housekeeper at Cae Bryn, and Amanda is a senior carer at Pen y Bryn. Pendine Park enrichment and activities co-ordinator Yvonne Moran, of Holt, enjoyed the sunshine with her 11-year-old grand-daughter Anna Lea. “It’s been a great day,” enthused Yvonne. Chris Redfern and Emma George, of Rhos, were there with children Megan George, 16, Martha George, 10, Pippa Redfern, four on the day of the Fun Day, and Ted Redfern, two. Emma is the unit manager at Cae Bryn care home. Organiser Jen, Pendine Park’s business and development manager, added: “The circus theme fun day was a lovely day, well attended by staff, residents and relatives, and a lot of fun was had by all. “The Pendine Enrichment Team did us proud and really got into the mood as clowns and ringmaster.